My name is Suzy and I live just outside Norwich in Norfolk. My love affair began with the breed over 15 years ago. A friend asked if I wanted an older kitten,and brought this little one with the super shiny coat, small in stature, with a HUGE personality. It was soo subtle this being owned by a Siamese cat 😉 One minute I was completely detached, and at other times he held me completely spellbound by his daily antics, one being pawing the top off the milk bottles to get at the cream! loyalty, in that he was never very far away from me and then, how he expressed himself vocally when he wanted to convey his thoughts to me, by yowling with a self satisfied smile on his face! I reasoned that if I wanted a cat, one who was very active, intelligent, who could be demanding at times, certainly interactive. 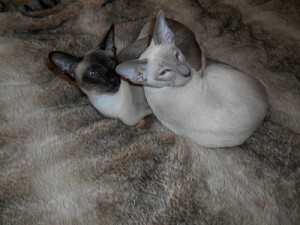 The Siamese breed would not be for me. Having said all that. IF I wanted a cat who showed me unconditional Love – Always. With loud purrs, which sounded as loud as a busy bumble bee!! I would choose this breed many times over! I hope you enjoy looking at a snapshot of my life with these wonderful cats. 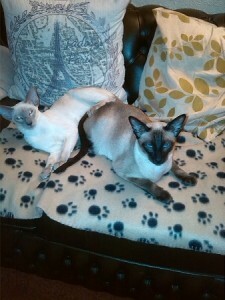 These days, I choose to keep my Siamese as indoor cats,and as there can be a boredom factor attached to them, acquired all kinds of toys, and a 12ft cat tree for their enjoyment!